The Montana Legislature is over. Hunters and anglers came out ahead thanks to the tireless efforts of local rod & gun clubs, groups like Montana Trout Unlimited, Montana Wildlife Federation, Montana Bowhunters Association, Montana Sportsmen’s Alliance, Montana Houndsmen Association, Wild Sheep Foundation and Montana Audubon. There were over 100 bills introduced that would have severely impacted our wildlife management heritage, access programs, water quality for blue ribbon trout fisheries, caused the unscientific management of wolves, lions and bears as well as deplete the FWP treasury of much needed funding to do simple things like study moose declines in Western Montana. These groups worked countless hours both in terms of staff, lobbyists and volunteers. They drove from as far away as Libby, Glasgow and Dillon to stand up for wildlife conservation and our outdoor heritage. Bills that would have required the test and slaughter of elk that test positive for brucellosis were met with almost uniform opposition from the hunting community. It should also be noted that this session saw a dramatic difference between the House of Representatives and the Senate when it came to working with hunters and anglers and moving positive, bipartisan legislation forward as well as killing bad bills. Our immense thanks go out to Chairman Jeff Welborn for standing up for common sense and sound wildlife management. WE didn’t always agree with Representative Welborn, but we always knew we could work collaboratively with him, and his well appointed committee. The House FWP Committee was a refuge for wildlife and hunters & anglers. The Senate Fish & Game Committee was once again the place where bad bills went to flourish. Chaired by Senator John Brenden, the committee continually passed bad bill after bad bill out in slap-dash fashion. Our immense thanks go out to Senator Kendall Van Dyk for his stalwart defense of Montana’s world class wildlife resource. Without his reasoning and knowledge, hunters & anglers would have had no educated voice on that committee. This is a long, rambling post, but that’s only because there was so much bad, and a few good things, that happened from January through April. · HB 73: Sponsored by Representative Kelly Flynn (R-Townsend) and co-sponsored by Representative Ted Washburn (R-Bozeman), this bill gave FWP the tools needed to successfully manage wolves without bowing the extremism that we saw in so many other bills. Originally crafted by FWP, the bill only saw one modification: it disallowed the FWP Commission from closing hunting seasons for wolves adjacent to National Parks. While we would have preferred that the politicians stay out of season setting, we felt that there was enough latitude given to the Commission to enact scientifically balanced hunting seasons around Yellowstone and Glacier. · SB 123: Sponsored by Senator Kendall Van Dyk, Hunters against Hunger is finally law. Derailed the last few sessions by small minded thinking, this bill saw all user groups come together to help establish a program that will provide high quality protein to those in need, while keeping local food banks from going broke while paying for the processing of venison and elk. · HB 401: Sponsored by Representative Jeff Welborn, HB 401 increased the amount of money collected by the agency for special licenses like Moose, Sheep & Goat. This will help offset the upcoming budget shortfall that FWP will experience. According to the department, this will help generate over $1.25 million a year to help fund wildlife management in Montana. · HB 235: Sponsored by Representative Ellie Hill, the Corner Crossing bill was more than just an attempt to open up 1.5 million acres of land locked public land. It was a show of force. 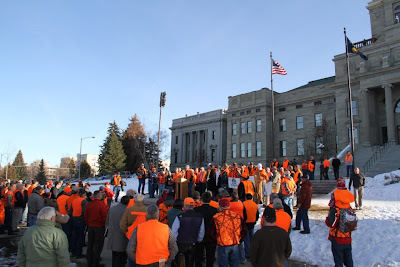 Over 300 hunters and anglers showed up to the Capitol on Monday, February 18th and turned the white grounds of the Capitol into a sea of blaze orange. While the bill failed to even come out of the committee, and even with the House gallery packed with hundreds of sportsmen, sportswomen and toddlers clad in camo, the message was clear: Don’t monkey with access, and don’t try and keep Montanan’s off their lawn. There’s been a lot of talk about the future of Corner Crossing in Montana, with several groups leaning towards drafting an initiative to take to the ballot. We don’t know if that would happen, but it does we think it would pass overwhelmingly. · SB 178: Sponsored by Senator Kendall Van Dyk, this bill sought to rectify a bad bill from last session, HB 607. 607 inadvertently diverted money from Block Management by allowing people to return a portion of their Non-Resident Big Game Combo. Ordinarily, that would have meant that when FWP resells the license, the appropriate amount of funding would have gone back to the Block Management Account. During the sausage making process, that didn’t happen in 2011. While this bill doesn’t restore all of the funding to Block Management, it does fix an oversight that has cost a lot of headaches. Early attacks on our access funding over controversial projects like the Milk River Ranch lead to some pretty bad ideas as well as a few decent ones. Bison, wolves and transplanting of bighorn sheep and all species seemed to top the list of the bad and the ugly. · SB 256: This bill would have forced FWP to assume liability for any damage done by wild bison. This is completely contrary to the over 100 year management model that Montana has used, and has been upheld by two Supreme Court decisions (Sackman, Rathbone). By making FWP liable for damages by bison, it precludes the time tested and effective methods in place for every other species. Normally, Landowners have to work with FWP to mitigate damage done by wildlife rather than simply expect a check. This bill would have set a dangerous precedent and while sportsmen and women were able to beat back other bills similarly focused on elk, deer and pronghorn, SB 256 would have been the proverbial camel’s nose under the tent when it comes to privatizing wildlife. Governor Bullock rightfully vetoed this poorly thought out legislation. · HB 404: This bill would have taken 25% of Habitat Montana funds and placed them into the Block Management Account. A lot of folks in eastern Montana who ranch and outfit claim that passage of I-161 has caused a loss of revenue to the Block Management program. The facts don’t bear this out. What the facts do show is that passage of HB 607 from the 2011 session diverted funds away from the BM account and put them in the general license account. This bill, touted as a way to get around the Corner Crossing issue, made it as far as the Senate Floor where it died. While we have the utmost respect for the sponsor, we can’t support raiding one access fund for another when there were better fixes out there: primarily SB 178, sponsored by Senator Kendall Van Dyk, which increased revenue and directed it to be placed in the right accounts. · HB 31: By mandating that the state only manage for the bare minimum number of wolves outlined in the FEIS for wolf reintroduction, this bill would have surely caused a relisting of wolves. The bill would have voided the USFWS approved Grey Wolf Management plan and caused another round of endless litigation. Rightfully killed in House FWP, this bill helped set the debate between sound, reasonable policy changes like we saw in HB 73 and the more outlandish, fear mongering bills that would come throughout the session. · SB 341: Sponsored by Freshman legislator Jennifer Fielder (R-Thomspon Falls), this bill sought to address translocation of wildlife issues thought to be a problem in terms of bison, bighorn sheep & every species of wildlife out there. The bill, while well intentioned, missed the mark dramatically. Sensing its impending doom in the House, Senator Fielder tried for a last minute series of amendments designed to make the bill more palatable. Unfortunately, the amendments did not make the bill any better and the House FWP committee put the bill to rest. · SB 397: Perhaps one of the most egregious attempts to manage wildlife through legislative fiat that we've seen, SB 397 would have changed management of large carnivores from scientifically based to socially based. The bills was supposedly an attempt to get ungulate populations rebounding, but by only focusing on carnivores, it ignores the seven sisters of wildlife conservation as outlined in the North American model, and most importantly, completely ignores habitat issues that we are seeing across Montana. · HB 396: The wildly successful restoration of wildlife in Montana was done through a state agency. HB 396 sought to reverse that success by giving county commissioners veto authority over wildlife transplants. Seriously. That’s what the bill did. Your County Commissioners already have their hands full with trying to mitigate impacts of oil & gas development, maintaining current roads and infrastructure and generally running a multi-million dollar enterprise on a shoe-string budget. Handing wildlife management authority over to them was bad not only for wildlife, but for the taxpayers who fund their County Governments. Thankfully, this bill got the veto pen as well. · HB 444: This was another attempt to gut the wildly popular Habitat Montana program and force FWP to spend another 25% on short term access easements. Despite testimony from the Agency and sportsmen’s & access groups that there already exists a program to do this, which, by the way, hasn’t been able to spend that money because the demand for short term access easements doesn’t exist, the Legislature pushed forward with this bill until the cooler heads of the House Appropriations Committee killed it. · HB 5: Not content to take the stinging defeats of HB 404 & HB 444, the Senate Finance and Claims Committee, lead by Senator John Brenden, placed a rider on Habitat Montana that would have allowed expenditures only for short term access easements. Again, the demand for this type of easement just simply doesn’t exist under the Access Montana program. We’re not sure why Senator Brenden thought this would be a good idea, other than the fact that he thinks sportsmen have enough access already. Governor Bullock line itemed this portion of HB 5 and restored the ability of FWP to conserve lands for wildlife and for hunters and anglers. · HB 33: Designed to try and reduce conflicts between livestock operators and large carnivores, the bill overstepped its direction immensely. The way it was written, FWP would have had to destroy every large carnivore that broke into a trash can, beehive, urban chicken coop or just looked sideways at a lamb. This was another bad idea that met the fate it deserved at the hands of a well educated and sensible House FWP Committee. · HB 312: This bill would have created a test and slaughter program of elk in the Yellowstone region. Fear of Brucellosis and Bison drove the bill forward. Under the bill, FWP would have been forced to eradicate brucellosis from elk. Since the science is clear that the only way to eliminate the disease from wildlife is to eliminate the wildlife, hunters showed up in force to oppose this bad bill. So did the Citizens working group who has been working on the Brucellosis issue for over a year. The House Agriculture committee isn’t known for passing good legislation or killing bad bills, but in this instance, the voted overwhelmingly to kill a really bad bill. It was disappointing to see Sportsmen for Fish & Wildlife stand up and support this bad bill. While some reporters have dubbed this session tame in comparison to last session it should be noted that the level of animosity to resident hunters and anglers and towards the scientific management of wildlife has not decreased. It has in fact become more focused. Interim studies designed to try and eliminate public lands are moving forward. So are studies to look at FWP’s funding sources. We fully expect the “Ranching For Wildlife” crowd and wildlife privateers to show up in force, claiming outrageous things like all hunting on public land is bad. We also except to see legislation come out of the interim similar to what Utah passed. Your public lands and public wildlife will always need the steadfast defenders that show up day after day.